Their brief and secretive romance made headlines in 2014. But having remained friends it was no surprise to see Ellie Goulding flashing a delighted grin as she cosied up to One Direction star Niall Horan, on Sunday. Sharing a sweet snap on her Instagram, the 29-year-old singer couldn't help but smile as she cosied up to her former flame, 23, and singer Shawn Mendes, 18. In the snap, the blonde beauty can be seen wrapping an arm around each of the two singers as they pose for a sweet snap. Beaming as she stares into the camera, the Burn hit-maker was obviously delighted to be in both Niall and Shawn's company. Currently touring alongside both musicians in the US, Ellie couldn't help but gush about their respective talents. 'On this radio tour with some mad talent.... these guys have been killing it. 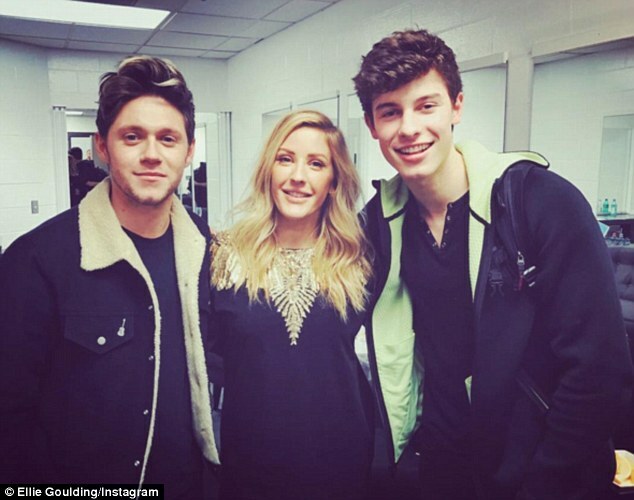 @niallhoran @shawnmendes,' wrote the chart-topping singer. Ellie's sweet snap came as the trio all took to the stage for solo sets during KISS 108's Jingle Ball 2016 at Boston's TD Garden arena. Niall and Ellie's tour reunion comes just a matter of weeks after the Irish star revealed he still holds a candle for his ex during an appearance on The Ellen DeGeneres Show. Taking part in a quick-fire game of Who’d You Rather with chat show host Ellen, he ended up picking the Love Me Like You Do singer as his dream date. Explaining the rules, Ellen told Niall: 'You're single. I'm going to try and find you the perfect girlfriend. We're going to play a speed round of Who'd You Rather? 'On this radio tour with some mad talent.... these guys have been killing it': Currently touring alongside both musicians in the US, Ellie couldn't help but gush about their respective talents. While he selected both Rihanna and Selena Gomez on three occasions each, beating the likes of Taylor Swift and Demi Lovato, it was Ellie he eventually settled on as his ideal woman. He selected the British beauty over Rita Ora, Jennifer Lopez and Kendall Jenner. 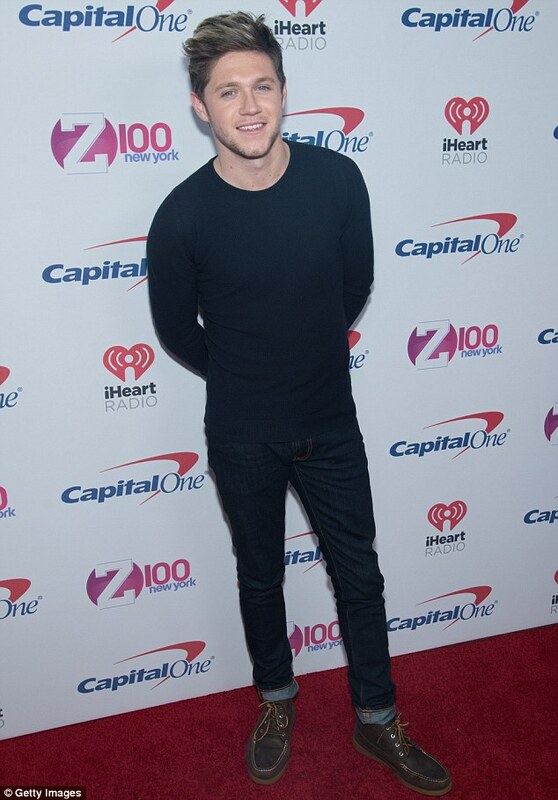 The game also revealed Niall has a penchant for an older lady, choosing Diane Keaton, 70, and Demi Moore, 53. Niall may have changed his mind however, as since then he has been linked to another former flame, Jessica Serfaty. Following his performance at the AMAs in November, Niall and the model, 25, took in a gig where they were reportedly seen getting cosy before leaving together. Jessica and the One Direction hunk were first linked back in March, when they were seen at a number of events in the US. Ellie meanwhile is believed to be dating fitness trainer Booby Rich, who happens to be a pal of David and Victoria Beckham. Judo champion Bobby was first linked to Ellie earlier this month after the pair were spotted out and about together in London. And with Bobby being a fitness instructor the pair share a common interest, with Ellie famous for her love of working out. 'They’re very close and both very keen on personal fitness and get on well with each other’s friends too, so it looks very promising,' a source told The Sun in November.